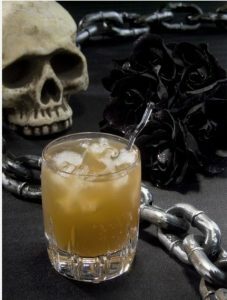 Halloween is the perfect time for drinks that mostly go UN-noticed, this one though sounds frightfully Yummy! This recipe will make 4 drinks. Pour Rum evenly amongst all four glasses. Fill with Ice and top with the Ginger Beer. Then have a howling good time! Happy Halloween!